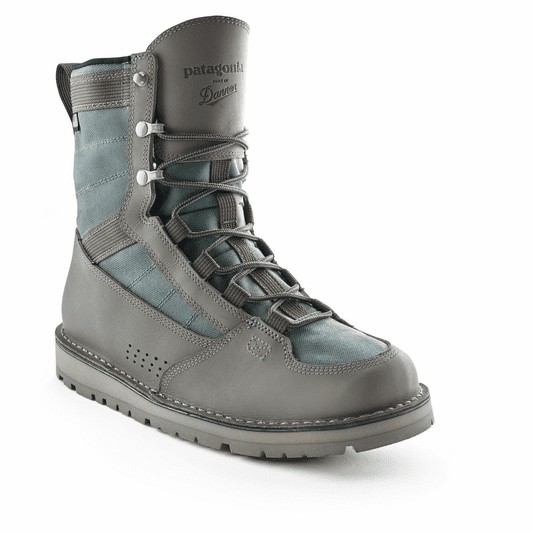 The new Patagonia River Salt Wading Boot built in Portland Oregon by Danner Boots is an awesome boot for flats fishing and for covering distance on the trail before your cast. We are super excited to stock the full range of Patagonia wading boots built by Danner. The River Salt is a very versatile boot. We see it as an awesome flats boot but also a great hiker�s wading shoe, a summer wet wading shoe, flats boot and running down the beach boot. Durable and protective enough for the corals of the Pacific but light enough to walk all day on the flats or stream with comfort. Purchase a pair of River Salt Wading Boots by Danner in any sole configuration and receive a $20 gift card at the Caddis Fly angling shop. The new Patagonia River Salt had a Vibram �Megagrip� sole designed for maximum grip on both wet and dry surfaces. We have found that Vibram soles offer the very best in durability. The Megagrip on the River Salt is fine in flats boats and great on the trail when you need to cover to ground before you fish. Studs can be inserted into the River Salt as needed. The River Salt uses full grain leather treated with a PFC-saline solution tanning process for durability even in saltwater. Unlike synthetic boots the full grain leather can form to your foot for a fit like no other wading boot. The Foot Tractor is constructed with durable 1,000 denier panels on its upper. Speed laces allow you to crank down the upper and provide super ankle support for a hiking boot like fit. The boots have medial and lateral perforations for drainage, a system tested and proven on Danner�s combat boots they build for the US military. The laces guides are not metal so you won�t get the rusty look on your flats boots. The River Salt features an innovative bi-fit board midsole that combines the shank, lasting board and midsole into a single piece, significantly reducing weight without sacrificing support and protection on rough and uneven surfaces. �Stictchdown� construction creates a wider stable platform and if you were to ever need to re-sole the boots it allows for easy recrafting at Danner.